Homesteaders in front of a sod house, 1886. Photo via National Archives. In 2017, a mere 1.3 percent of American workers, or 2.6 million jobs, were directly related to agriculture. But we’re a nation largely built on farmers. In 1900, 41 percent of the United States’ workforce worked in agriculture. As time went on, these farmers adapted to crises, world events, and new technology. In turn, they’ve shaped not just the way we eat, but also the cultural and physical landscapes of our country. This is a brief history of American farming, as told through pictures, starting in the post-Civil War era. America’s love-affair with manifest destiny was made possible by farmers. The Homestead Act of 1862 encouraged all Americans—except confederate soldiers—to head west and settle the country’s wild Great Plains. Any citizen who could find 160 acres of land and farm it for five years received that land free. Black Americans were eligible, as were women, and by 1898, so were immigrants. A family with their covered wagon during the Great Western Migration, 1866. Photo via National Archives. “Residence of G. L. Rule Feb. 18, 1898. Have lived here since Sept. 1893.” Photo via National Archives. But for many Americans, working the fields was far from idyllic. Slavery largely built the South and gave it a prosperous economy: before the Civil War, the South produced 75 percent of the world’s cotton and would have been the fourth richest nation in the world had it not been part of the U.S. Following the war, many emancipated slaves made their way along the Mississippi River to Kansas, searching for jobs or homesteads of their own. Some would form the town of Nicodemus, which is the only still-standing (albeit uninhabited) western town founded by African-Americans. Born into slavery, George Washington Carver died as one of America’s most brilliant agriculturalists. Between 1900 and 1910, Carver discovered over 300 uses for peanuts—from peanut sausage to shaving cream (but not peanut butter)—and hundreds of additional uses for soybeans, pecans, and sweet potatoes. He also pushed for the use of crop rotation, netting better yields and bolstering a farm’s sustainability. His discoveries were badly needed in Alabama, which had lost much of its cotton crop to boll weevil. Peanuts were in high demand, and Carver has been credited with saving the South’s economy. While many farms had been small, local businesses, that changed with the outbreak of World War I. With Europe in a food crisis, America’s heartland exports were badly needed. Homefront war efforts encouraged Americans to farm surpluses for export and for personal storage. Propaganda campaigns also encouraged citizens to conserve food—before “meatless Mondays” there were “wheatless Mondays,” “meatless Tuesdays,” and “porkless Saturdays.” And the government created victory gardens, turning any unused plot of land—from rooftops to parks—into a garden. In 1931, everything changed. The winds across the plains started to kick up dust, growing into continuous dust storms large and strong enough to blot out the sun and encase entire homes. It created lung-related illnesses, ruined crops, and for many farmers, felt like “two midnights in a jug.” Caused largely by drought and overfarming, the Dust Bowl would last until 1939. During this era, which was already suffering under the Great Depression, Franklin D. Roosevelt and Congress implemented the Soil Erosion Service—now known as the Natural Resources Conservation Service—and the Prairie States Forestry Project, which would educate farmers about soil erosion and plant trees to create windbreaks. About 2.5 million people migrated from the Dust Bowl states, abandoning once thriving farmland. Between WWI and WWII, slowed immigration and high surplus farming needs led to the nation’s first migrant worker initiatives. The first guest worker program, the Immigration Act of 1917, saw about 77,000 Mexican-born farmers enter the country. 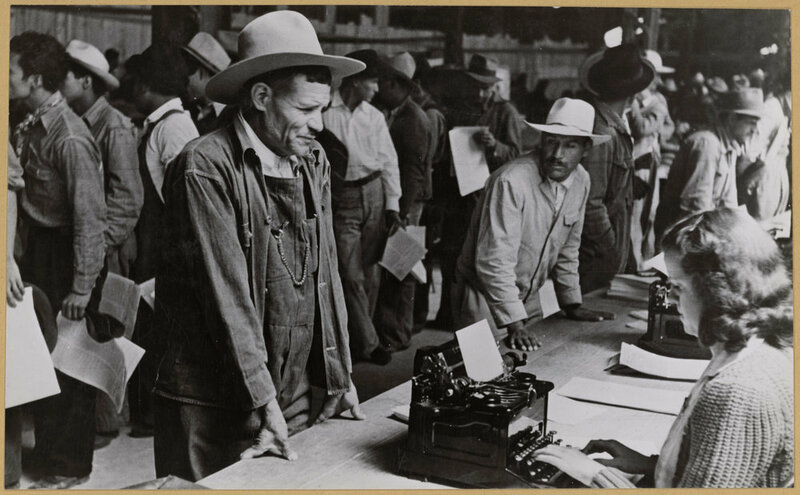 Established in 1942, the Bracero Program allowed millions of Mexican men into the United States for temporary work, primarily on farms. The program ran until 1964; by the end of it, some 4.6 million contracts for new and returning workers were signed. While the program was only intended for labor shortages, many landowners abused the policy to keep low-wage workers. Farm wages dropped, and abuse of the program essentially led to the southern border immigration problems we have today. Mexican farmers who have been accepted to the Braceros Program, circa 1942- 1945. Photo via National Archives. New machinery, pesticides, and chemical fertilizer discoveries dramatically increased postwar crop production, which led to surplus yields. To keep prices stable, the government introduced several programs to buy those surplus crops. The Food for Peace program in 1954 sent surplus foods to impoverished countries. The National School Lunch Act of 1946 aided schools in purchasing nutritiously healthy lunches., and in the 1960s, the Food Stamp Act was signed into legislation. By the 60s and 70s, the rise in surpluses also led to another major change: global sales. 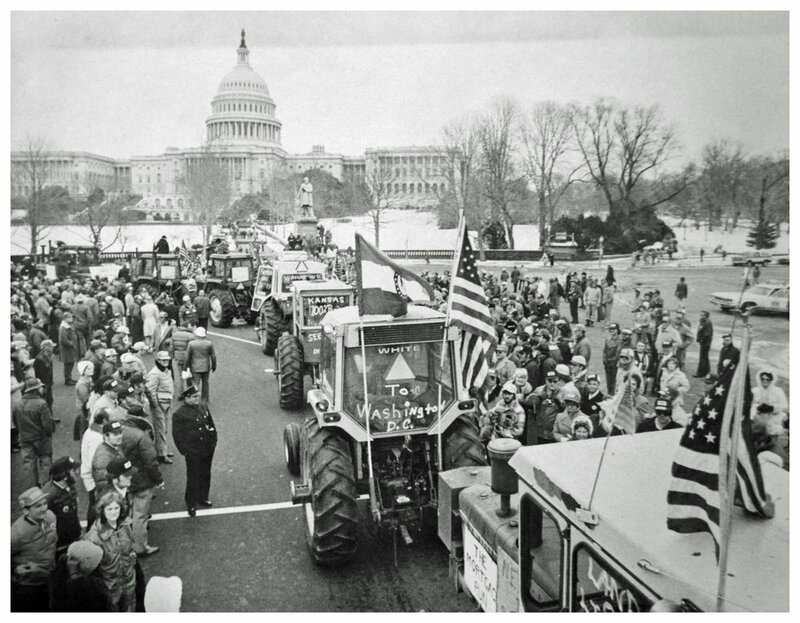 Farmed exports to other countries—particularly to the Soviet Union—exploded. The fallout was exacerbated by the 1980s recession. Throughout the 1980s, farmers abandoned their fields and left town. Once thriving rural towns were gutted. In recent years, cultural trends like the slow food movement have paved the way for a return to simpler (or at least less pesticide-friendly) farming. Farmer’s markets, for example, once a way of life for many small farms, fell out of vogue with the mass presence of supermarkets and the advent of refrigerators. In 1948, there were just six farmers markets in California. In 1994, there were 1,775 nationwide. By 2017, there were 8,687. 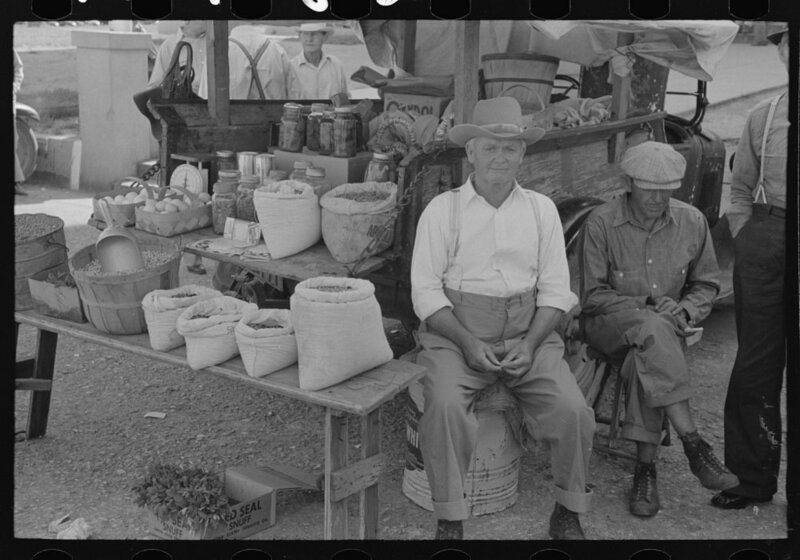 A 1939 farmers market in Weatherford, Texas. Photo via National Archives. Pesticides and GMO foods have been losing ground—albeit slowly—to their organic and non-GMO counterparts. According to the Organic Trade Association’s 2018 Organic Industry Survey, organic food sales made up just 5.5 percent of all food sales in 2017; however, that number has been rising year over year since at least 2006. At home, the millennial generation is taking up gardening, going back to centuries-old methods of slow, methodical cooking from whole ingredients, and developing a borderline obsession with Mason jars.